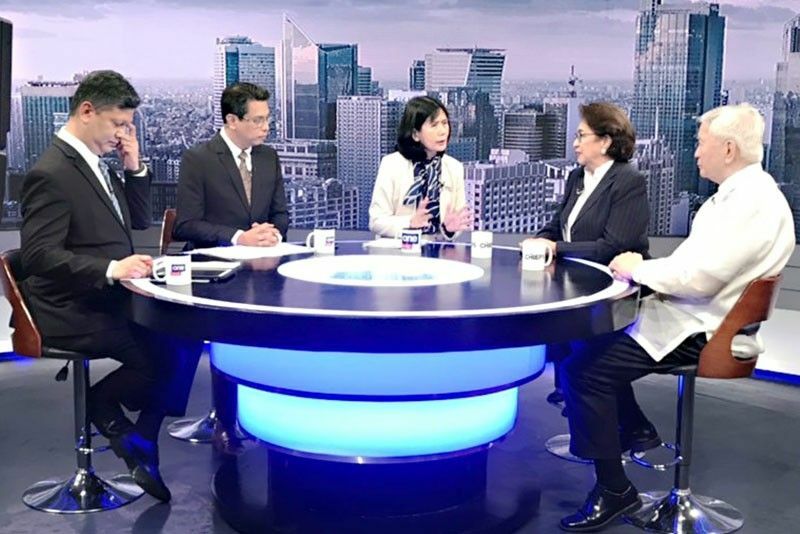 Former foreign affairs secretary Albert del Rosario and former ombudsman Conchita Carpio-Morales answer questions from The Chiefs hosts Amy Pamintuan, Roby Alampay and Ed Lingao yesterday. MANILA, Philippines — Private citizens of the Philippines are free to express their “righteous indignation” against China for its construction of artificial islands in the South China Sea and to bring the case before the International Criminal Court (ICC), Malacañang said yesterday. Unlike in the ICC’s “preliminary examination” of a complaint against President Duterte for crimes against humanity in connection with his bloody war on drugs, presidential spokesman Salvador Panelo indicated that the government would not prevent the private complainants from pursuing the case they filed before the ICC against Chinese President Xi Jinping for environmental offenses that constitute crimes against humanity in the South China Sea. Former foreign affairs secretary Albert del Rosario and former ombudsman Conchita Carpio-Morales, backed by several fishermen affected by Chinese activities in the West Philippine Sea, filed the complaint two days before the withdrawal of the Philippines from the ICC took effect on March 17. The landmark complaint will test the ICC’s decision on Sept. 15, 2016 to include crimes that are committed “by means of, or that result in, inter alia, the destruction of the environment, the illegal exploitation of natural resources or the illegal dispossession of land” among the offenses covered by crimes against humanity and which the court can prosecute. Del Rosario and Morales, who faced The Chiefs yesterday, expressed optimism that the ICC would find merit in their complaint. They stressed that even with the withdrawal of the Philippines, the ICC can have jurisdiction over offenses committed while a state is a party to the Rome Statute under which the ICC was created. Duterte has maintained that the Rome Statute was not published in the Official Gazette even after the Senate gave its concurrence, so the country was never a state party to it. The Supreme Court is still deliberating on whether Senate approval is also needed for the country to withdraw from the ICC. Anne Marie Corominas, legal consultant in the filing of the case against Xi, told The Chiefs that the act of withdrawal indicated that the country did recognize its ratification of the Rome Statute. United Nations special rapporteur on extrajudicial executions Agnes Callamard has voiced support for moves by former Philippine officials to hold President Xi accountable for “crimes against humanity” before the ICC for China’s island-building activities in the South China Sea. “The courage and resilience of the Philippines people and civil society amaze me: 2 ex-officials and fishermen filed a complaint against China President Xi Jinping before the ICC for crimes against humanity over environmental damage in the South China Sea,” Callamard said in a Twitter post on Thursday. Former foreign affairs chief Del Rosario and former ombudsman Carpio-Morales have sent a communication to ICC prosecutor Fatou Bensouda asking her to initiate a preliminary examination on China’s activities, mostly in waters within Philippine territory. Del Rosario and Morales, in their 17-page communication dated March 13, said China has committed crimes within the jurisdiction of the international tribunal, noting the disastrous impact of Chinese activities on vulnerable fishermen, including Filipinos, who were deprived of food and livelihood. The communication was sent to Bensouda days before the Philippines’ withdrawal from the ICC became effective last Sunday. President Duterte unilaterally withdrew the Philippines from the Rome Statute, the treaty that established the ICC, after repeatedly being warned of possible legal implication of his bloody war on drugs. Callamard had been a target of Duterte’s diatribes for her strong condemnation of his war on drugs. Also expressing “unequivocal support” for efforts to hale the Chinese leader to an international court was opposition senatorial candidate Florin Hilbay, a former solicitor general and member of the legal team that helped the county win its maritime arbitration case against Beijing. “I express my unequivocal support for former SFA Del Rosario and Ombudsman Carpio-Morales, and the hundreds of thousands of Filipino fishermen who are victims of environmental damage in China’s quest to solely and fully occupy the South China Sea,” Hilbay said. He is running for senator under the Otso Diretso ticket. “All these transgressions done by the Chinese government were possible because of a single reason: the Duterte administration failed to protect our sovereignty when they refused to defend the tribunal’s decision in the case we won against China in July 2016,” he said. The Duterte administration “welcomed China within our shores and allowed it to militarize artificial islands over our territories, refuse our fishermen access to their livelihood, and let illegal Chinese workers steal jobs that were supposed to be for Filipinos,” he said. “If this government will not defend us and our future generations from China’s occupation and destruction of our resources, we will,” Hilbay stressed. Sorsogon Bishop Arturo Bastes also praised Carpio-Morales and Del Rosario for their effort to hold Xi accountable. “I am happy that this brave lady (Morales) is courageous to face a Goliath at the ICC! Being a former ombudsman she knows what she is doing and that she has the right and duty to prosecute a foreign power for the good of our small country,” said Bastes. Bastes chairs the Catholic Bishops’ Conference of the Philippines-Episcopal Commission on Missions (CBCP-ECM). Former Senate president Juan Ponce Enrile, for his part, said that while he acknowledges the Philippines’ territorial rights, he would opt for negotiations with Beijing to settle the matter. Enrile is making another Senate bid in May’s midterm elections. “We have a right that is given, not only given by a convention and agreed upon by the international community through the United Nations, but also pronounced by an international arbitral body,” Enrile said. “But having that right does that vest on you the capacity to exploit your right because somebody is claiming it too. “In the game of nations, there are only two options that are available to us. Either we raise an army to match our competitor over that claim or we approach it through discussion, talking, negotiation,” he said. “If we opt to fight China, we must have the money to raise an army, if at all. And even if we can raise that money, are we willing to sacrifice the blood and lives of our young people to fight a war that we may not be able to win? And even if we win, could cause us ruin,” Enrile added. Meanwhile, opposition senatorial candidate Chel Diokno has urged the international community to continue to press the Philippines to comply with its commitments under international law. He was among those invited to speak via video conference at a side event of the United Nations Commission on Narcotic Drugs annual meeting in Vienna, Austria last Thursday. “We do hope that the international community will continue to put pressure on the Philippine government to adhere to its commitments under international human rights instruments,” Diokno said. Diokno stressed the importance of the ICC, citing the immunity of the President from lawsuit. “I’m really so concerned about this because under Philippine law, we have what is known as presidential immunity from suit,” Diokno, who is running under Otso Diretso, said. “Under the principle of complementarity, we will not be able to prosecute President Duterte in the Philippines,” he said.